I've been getting Barkbox for well over a year and have enjoyed the boxes. This month, I decided to switch it up and get the Allergy Friendly box for awhile. This is something that's really easy to do right from your account page. 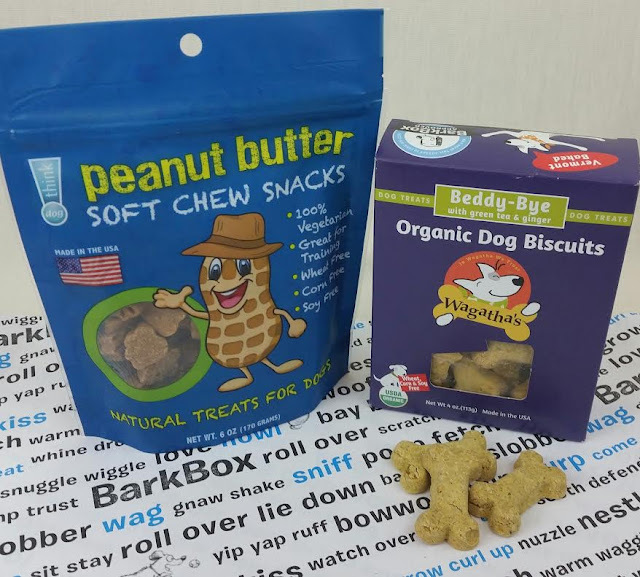 This is an option that very few dog box subscriptions offer, although PawPack comes the closest because their default box generally avoids products with some of the most popular allergy causing ingredients like soy, grains, etc. Since I have a dog allergic to chicken, getting some of the more unique sources of protein like kangaroo, rabbit and duck works out well for me. This review is for the Small dog box for 10-20lb dogs. The Cost: $$29/month. Get one free month added to your subscription with my referral link. 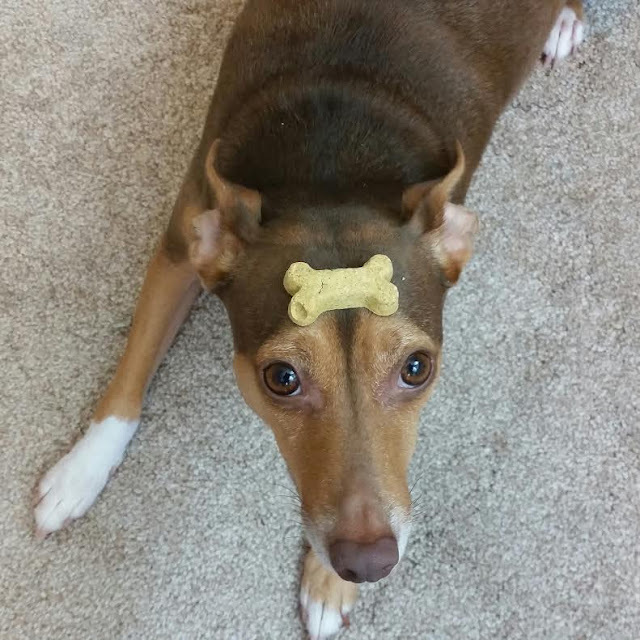 ThinkDog Peanut Butter Soft Chew Snacks- I didn't know ThinkDog! made treats! I alway associate them with brain teaser toys. These treats are made in the USA without corn, soy or wheat and thankfully, no chicken! These are the kinds of treats I use when rehearsing tricks or rewarding Bugsy for remembering which toy is his "dolly" and which one is his "grapes" or "raspberry." I watched a show once about a border collie and how he knew the names of 100 of his toys. Then they tricked him and asked him to get a toy he didn't know (I think it was a soccer ball) from the swath of toys in front of him. He was SO smart he picked out the one toy he didn't know and gave it to the trainer! Now I work on this with Bugsy. Wagatha's Beddy Bye Biscuits with Ginger and Green Tea- These treats are made in Vermont and are 100% certified organic. Both dogs LOVED these. I was surprised because I don't think they've ever received treats with ginger or green tea so I wasn't sure what the reaction would be. They were a resounding success. Even better, they are Wheat, Corn and Soy free. Since there are no potential allergens, this is a treat I can give to both dogs without worries. 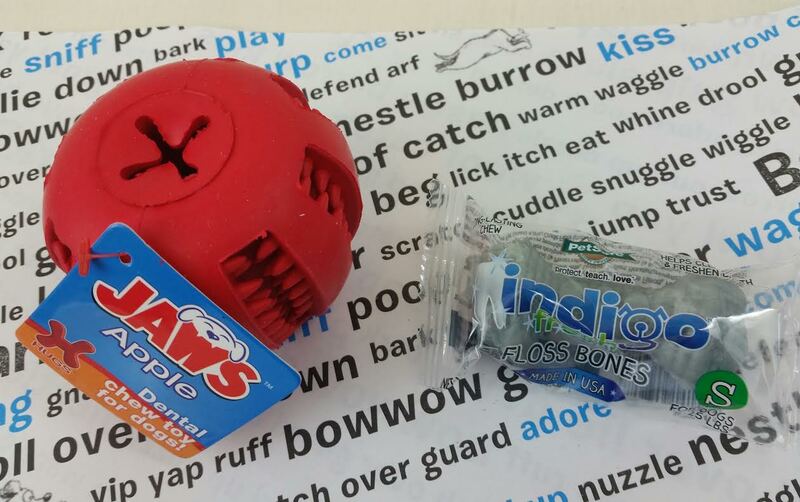 Hugs Pet Products Jaws Apple Dental Chew for Dogs- So I thought Bugsy would hate this. He doesn't normally go for rubber toys. But apparently the ball shape won him over. It's a little too heavy for him but I stuff treats in it, just in case he decides to play. PetSafe Indigo Treats Floss Bones- Dexter is going to be six and I think that means it's time for a dental soon. I'm going to give this to him since there's only one. 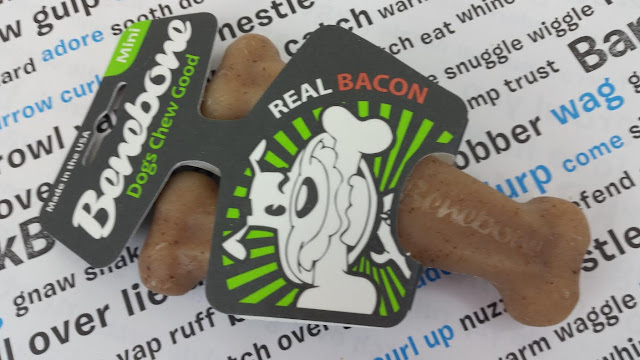 Benebone Mini Real Bacon Dog Chew- This was the biggest surprise for me out of all the things in this box. I've mentioned before that one of the best things about getting a dog box is finding toys you never knew your dog would love. This is one of those things. Dexter, who is not really toy oriented, grabbed this immediately and has been keeping it in his bed and chewing it regularly. He loves it! I'm really happy about that because I have been worried about his teeth and he just... he doesn't play much. He's kind of weird. So I was really glad to have received something that he could like. VERDICT: This Allergy Friendly Barkbox turned out to be a big win for me. Not only did I get treats I can feed to both dogs, I found a toy (bone) that Dexter likes! It also has one of the better values of boxes I've received. I don't get Barkbox (or any dog box, for that matter) in order to get a deal. I get it for convenience- it saves me a trip to the pet store, and I get it for the novelty factor for my dogs. I have found some truly wonderful, well-loved toys that I would not have even looked at when hunting toys for the boys. The toys that don't get used, I deliver to a local shelter where they are much appreciated. So no matter how I look at it, Barkbox is always a benefit and worth the $30 for me. If you'd like to try Barkbox, you can sign up here. If you use my referral link, you will get a free box added to your subscription. If you specifically want the Allergy Friendly box, sign up then go to your account and click the drop down box that says "I have Allergies!" (or something similar). It's really easy to cancel and/or modify your subscription right from your account and that is another thing I appreciate about Barkbox. You can also repurchase well-loved toys in their shop or even add a toy to your regular box for an additional $9 a month. I think that's a good option if you just want to get one box but have 3 or more dogs. 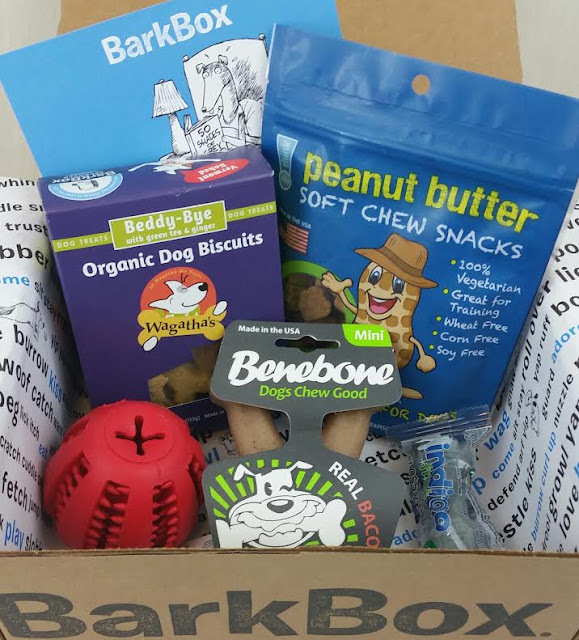 What do you think of Barkbox? Have you been getting the Allergy Friendly boxes? Have they lived up to your expectations? Yeah, those roasted bones are messy. I usually send them outside with them but now the weather is rainy and gross so I have to watch them carefully on their blankets (which I then wash once they're done). Bugsy is too insecure to do a competition, sadly. He would probably attach himself to my leg and then trip me at every opportunity. Haha! Wouldn't that be awesome to be sponsored by Barkbox? I think Macho has a better chance of that. At least he sits still for photos!